With an indoor cycle training program, the hill doesn't end until you're ready for it to end, but that's not the only benefit of using the Best Fitness Indoor Cycle. When you ride in the comfort and convenience of your own home, you're not limited by the unpredictability of an outdoor terrain, the weather or traffic. You'll also be able to use the Best Fitness cycle fully and have the freedom to close your eyes and concentrate on your pedal cadence without crashing into a tree! 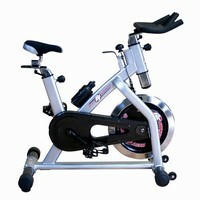 Click the button below to add the Best Fitness - Indoor Cycle to your wish list.